Molecular, Genetic and Biochemical approaches to identifying evolutionarily conserved mechanisms that regulate cellular and organism survival and longevity. 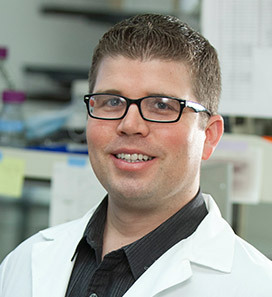 Sean Curran, PhD, focuses on understanding the regulatory control mechanisms that govern animal health across the entire lifespan. Decades of studies in the biology of aging have looked at extending lifespan as a measure of success. Although this approach has uncovered several potent regulators of animal lifespan, there are also examples of long-lived animals that exist in a decrepit state. Obviously, this was not the intent of biogerontologists as our actual goal is to increase healthspan, or the time of life spent in a healthy state. With this in mind, my research group has invested in defining molecular, genetic, and environmental factors that impact multiple parameters of health (resistance to environmental and dietary stress, mobility, metabolism, reproductive-fitness, and mitochondrial function) throughout life. Our goal then is not simply to push the limits of life expectancy, but rather to maximize the quality of health over the largest possible period of the lifespan. Our long-term goal is to generate blueprints that allow an individual to maximize health over the course of their lifespan. Informed by genetics, we develop the capacity to predict which diets are ideal for a healthy life and which should be avoided. Moreover, we investigate the mechanistic basis of the molecules, genes, and pathways we have discovered can influence healthspan. The product of this investment is the ability to use diet as a means to circumvent genetic predisposition and prevent or reduce the severity of age-related disease. Our research has benefited from the ability to quickly test several diet-gene pairs in C. elegans, which has allowed us to transition to directed studies in murine models. Although we will continue to exploit the utility of genetics and biochemistry of the worm, we expect that our mouse and cultured human cell approaches will synergize and provide relevant information for human aging.